Below is some info on the GEL I have been using, and am distributing. I started using it about 5 months ago, and it is significantly changing my life. I am blown away by my experience. In addition, I have read 100’s of testimonials from other people using the gel who are also experiencing amazing results. I can add you to the testimonials page on FB if you would like me to. I LOVE this product so much that I want to share it with everyone I know! I do believe that it is life changing / a game changer. After a few weeks of feeling all the changes, I became a rep because I knew i would want everyone I know to try it. And when my husband saw the effect it had on me, he started using it also. Let me know what interests you about The Gel. What issues are you having? And let me know if you have any questions or are interested in trying it! In addition to the information below, I am also happy to talk with you about it. Email is great, or if you prefer, phone and text are fine too. The Gel is the first and only 100% safe, FDA Registered, homeopathic, HGH (human growth hormone). The HGH found in the gel is a synthetic plant based human growth hormone called Somatropin, which is bio-identical to the growth hormone your body naturally already makes. It is transdermal (meaning topical), and it is a micro dose that is formulated to provide you with the maximum therapeutic benefit of HGH without a prescription. The Gel also has thyroid and adrenal support. For a full list of the ingredients, click here. What does HGH do? HGH is a hormone made in the pituitary gland that stimulates growth and cell regeneration. It regulates tissue healing, heart, brain and overall nervous system health, sugar and fat metabolism, muscle and bone strength, and the fluids in your body. Everything from your mood, to your sleep, your energy levels, your bone and muscular strength, your skin, your blood and your hair, relies on having healthy levels of growth hormone. The Gel affects almost every cell in the body, rejuvenating the skin & bones, regenerating the heart, liver, lungs & kidneys, preventing osteoporosis and more. In clinical human studies, continued use of HGH has been shown to offer incredible results. It is the most effective anti-obesity drug ever discovered, revving up the metabolism to youthful levels, re-sculpting the body by selectively reducing the fat in the waist, abdomen, hips & thighs & at the same time increasing muscle mass. It is cosmetic surgery in a bottle, smoothing out facial wrinkles, restoring the elasticity, thickness, and contours of youthful skin; reversing the loss of extra cellular water. It enhances athletic performance, allowing you to do higher intensity workouts of longer duration. It reverses insomnia, restoring the “slow wave” or deepest level of sleep. And it is a mood elevator, lifting the spirits along with the body, bringing back a zest for life that many people thought was lost forever due to age and/or illness. This product has a 92% retention rate for use. It can potentially take 3-6 months for someone to feel most of the benefits, (depending on age, weight, health, metabolism, & other variables) although there are countless testimonials of people feeling results within 2 to 6 weeks. There are no known side affects, and no known interactions with other drugs or medications. Like a good friend of mine said, ‘it would be silly NOT to at least try it!” I felt the same way! Improved mood, depression and anxiety lifted; ongoing experience of just being happy, feel joy, gratitude, appreciation. My husband as noticed significant difference. My piano playing has greatly improved. More dexterity, sight reading music better, more feeling and freedom. My piano/voice teacher says I seem more confident. Perhaps an increase in my metabolism, seem to be digesting food better. Menopausal acne gone: I was breaking out often, and have had almost no breakouts since I started the gel! Hair: new baby hairs around my forehead where there have been super thin spots/receding hair line. Yoga Injuries; Most are GONE. I am able to do many postures I have not been able to do since surgeries, in spite of trying everything to heal it. Pain relief: I have had hand discomfort and pain and was taking high does of supplements to relieve it. My hands feel much better and I have cut down on over 50% of the supplement already. Eyelashes & Eyebrows filling in. *In addition, I am experiencing what my husband describes his experience as a ‘higher level of consciousness’ that he is experiencing also. He has said that his memory and word recall has improved, as well as his focus, resourcefulness, and energy. 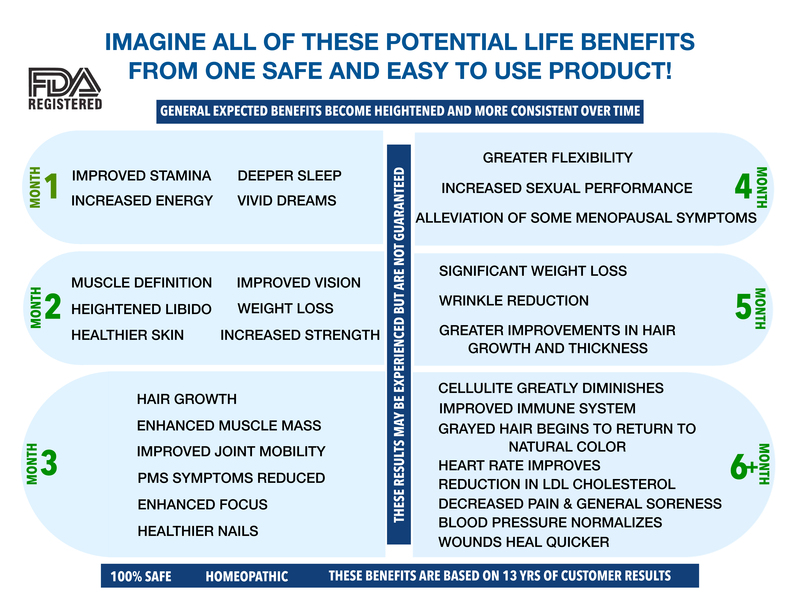 I am having a continued experience and expansion of all of the benefits listed above. Sleeping deeply and through the night most nights, except when my cats jump on my head or I have to get up to pee. The good news it that I fall right back to sleep. (*before the Gel, I rarely slept more than a few hours at a time, and very lightly. When I woke up, it would take awhile to fall back to sleep). I have had no UTI’s or yeast infections since I started the Gel. I used to get them often. I have taken very few no naps since I started the Gel. I used to take them regularly or drink coffee mid day. I am a committed lover and drinker of coffee. I had to switch to decaf (a very strong, yummy, and french press version however) because I have so much energy my normal coffee was making me jittery and uncomfortable. I find that other products that I use are more effective since I have been on the Gel. My old injuries have continued to heal and I feel more fluid and flexible in my body. For over 5 years, before the Gel, I was not able to straighten my left leg in deep yoga poses, do half lotus on my right side, or do deep back bends because of an old injury, surgery, and too much wakeboarding. I had tried everything to heal it and nothing improved it more than small amounts, until the Gel. Check me out now! At 62, I am back to doing Mysore Yoga and thrilled about it. Let me know what you think. Happy to send more info and links to videos on additional topics if you would like them.